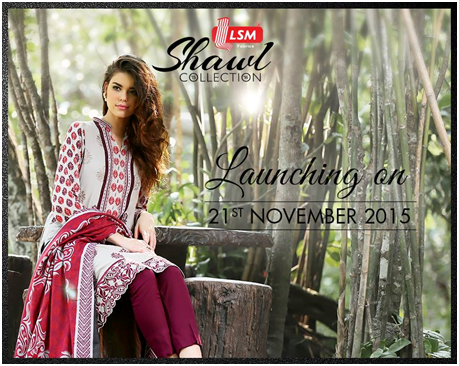 The renowned textile brand LSM Fabrics (Lakhany Silk Mills) will showcase their latest winter shawl collection on 21st November 2015. Lakhany Silk Mill’s Shawl Collection features special weaved winter fabric for you to stay warm. It is designed explicitly for this chilly weather in order to keep up with the females who feel too cold and are indecisive of wearing what in winters. The collection have a lot of varieties with stunning designs. The fabric and wool used in the preparation of these shawls is of very high quality and are very soft.Moreover the embellishment with different type of thread works and embroideries have enhanced the quality and elegance of these shawls. Lakhany Silk Mills (LSM Fabrics) specializes in producing premium quality products made from superior material, utilizing their state of the art technology & equipment. LSM’s Fashion mission is to cater to every fashion-savvy and trend-setting Pakistani women, offering stylish, seasonal and trendy options for every occasion. With the arrival of winter season, LSM Fabrics is keeping its legacy by introducing its winter Shawl collection with unique showcase of warm yet vibrant designs. Shawls are much needed in such cold weather here in Islamabad. Loving the collection.